The librarians behind the project freely admit that they don't exactly have a great handle on the images in the collection. They know what books the images come from. 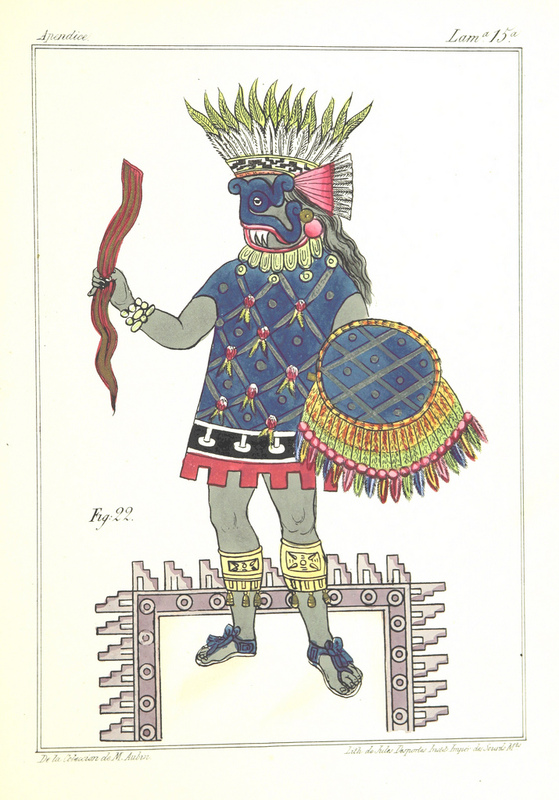 (For example, the image above comes from Historia de las Indias de Nueva-España y islas de Tierra Firme, 1867.) But they don't know much about the particulars of each visual. And so they're turning to crowdsourcing for answers. In fairly short order, the Library plans to release tools that will let willing participants gather information and deepen our understanding of everything in the Flickr Commons collection. You can jump into the entire collection here, or view a set of highlights here. The latter happens to include a curious image. (See below.) It's from an 1894 book called The United States of America. A study of the American Commonwealth, its natural resources, people, industries, manufactures, commerce, and its work in literature, science, education and self-government. 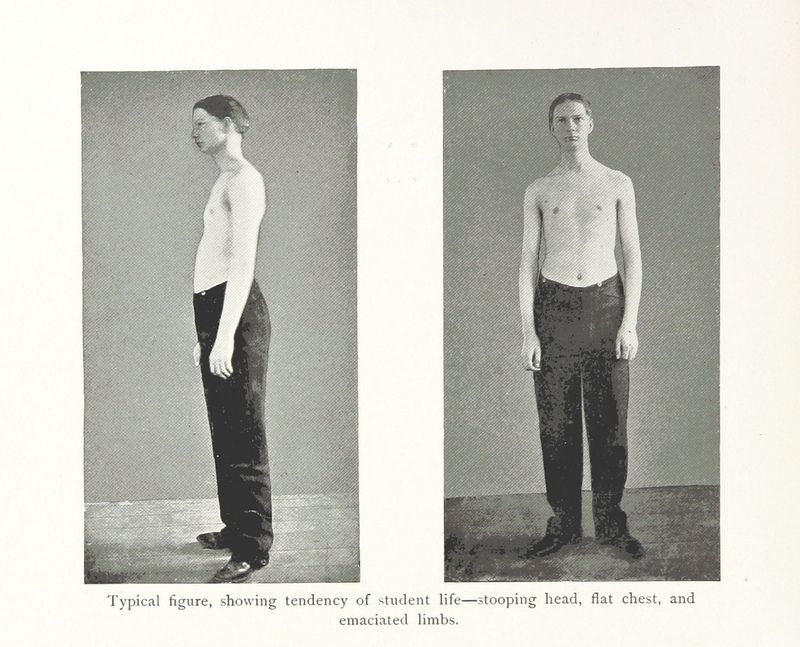 And the picture features, according to the text, a "Typical figure, showing tendency of student life--stooping head, flat chest, and emaciated limbs." It's hard to know what to say about that. To learn more about this British Library initiative, read this other Open Culture post which takes a deeper dive into the image collection. In America, these images had been in the public domain for some time, because they had been published before 1922. So Microsoft didn’t “release” anything, and the British Library didn’t need permission to put into the public domain what was already there. But in the UK, the BL still owns the copyright to scans of images in its collections, so these images were not free of copyright restrictions until the BL decided it was. International copyright law is quite complicated, and has to do with the owner of the physical object, as well as the date of creation of the object. These images were already in the public domain. What the British Library did was put them online, which is nice, but it’s hardly the same thing. What’s with the solarization on the students pant legs? They really did all that scanning work and then reduced the quality so that there are just a few tones of black on that pant leg?!!? Sometimes doing poor archival is worse than no archival because now that it’s “done” no one is going to re-do it. Here’s to hoping those scans are better at the source. You’re misguided here. I’ve been a professional print production artist for nearly two decades. Look more closely at how the tones look; it’s clearly NOT the result of digital posterization. It is a scan from a printed book; what you think is “solarization” is a low line screen on the printing of the BOOK that they had. This is a perfectly fine digital facsimile of a bad reproduction of a photo.nnnAnd, being a library, it seems pretty likely that they would have a book but NOT the original photo used in the production of the book. You missed one small detail: Microsoft digitized/ photographed the images, and from a legal point of view, those images are copyrighted. Cairo Observer posted this today on its facebook page. Thanks all for letting me know. This article says the images are “free to reuse and remix.” However, when I go to the Flickr commons there appears to be no way of downloading them, and Save Image is disabled. Do you have to be a member? Or am I just missing something here? “gifted”? And don’t tell me it is common usage. It is common enough and commonly used out of a combination of pretentiousness and tastelessness. I’m a third world writer and hope to start my own modest cyber museum and archives as it’s a neglected and poorly understood subject over here. I love reading about public domain resources and will link with them once I get going. Dont get me started on the US and copyright. Youtube disregards the fundamental rights of TV and film makers world wide, passing the buck of responsibility to the person uploading the video. If roles were reversed and it was a non-US company doing this we would never hear the end of it and the US courts would certainly take them to the cleaners. I pay a license fee for my TV, I am fed up of seeing this US company rip off the TV companies and producers in my country. The Youtube generation think they can have something for nothing – wrong – film makers need paying, actors need paying and standards suffer if they cannot get their dues. Click on the image. It will bring it up by itself. Then right click and Save as. Wile the original work copyrights have expired, the work of others based on that work has not expired. So you -can- use the orginal images…if you get them yourself. To use the ones others have already got … they own the rights to *their* work. Readers of this piece might be interested to know that researchers at Cardiff University, working with the British Library and Arts and Humanities Research Council, have created a database to actually search and classify the 1m images at: http://illustrationarchive.cardiff.ac.uk. Nope, not under current U.S. case law. There has to be an element of original human creativity involved. Mere mechanical reproduction (scanning or a straight photographic reproduction) isn’t enough. See Bridgeman Art Library v. Corel Corp., 36 F. Supp. 2d 191 (S.D.N.Y. 1999). There have been similar rulings in other countries (most notably, the United Kingdom). Your mileage in other countries will vary. How do you get these images into a form more suitable for print? 200-300 dpi and eps or png format? Actually, according to a recent Supreme Court Ruling, simply owning the original public domain image, or photographing, scanning, etc. does NOT impose a new copyright on that image. It has to be SUBSTANTIALLY altered in order for the image to be under a new copyright. The court (rightly) determined that publishing, scanning, adjusting quality, altering tone, colorizing, etc. does not alter the original image enough in order to be considered a new work. If it’s published in a book, the image itself is NOT under the copyright of that book. If it’s photographed by a museum and put up for sale, the museum can rightly charge for that print, but not claim copyright. If someone takes a photo or scans that print, they have NOT violated copyright. Once in Public Domain, it remains in Public Domain. excellent thank you for that tidbit, makes this even more interesting! Actually . . . no. A lot of people think they have a copyright on a scan or a photo of a public domain image that they happened to do, but (in U.S. courts, anyway) this claim has consistently not held up. Courts have consistently ruled that a simple reproduction of an image lacks sufficient originality to qualify for copyright protection. It doesn't matter how much time, money and effort went into copying it. The resulting repackaged image is still PD. Now if you copied an old PD image and you drew a funny mustache on it, or used some crazy color filtering for a neat visual effect, THAT image would be copyrightable. Similarly, if you photographed a 3-D object like a statue, your photo is copyrightable. Because you make creative choices about shadows and angles and whatnot. It includes creativity and not just mechanical reproduction. A scan or photograph of a 2D image does not and is not protected by copyright. A copy of a PD image is a PD image. You need to do more than just copy it for it to be protected. Just to clarify… so this resource can be legally used from the U.S? Also, one is definitely allowed to alter/edit the images? Thanks!